Robotic Waterjet Cleaning is an approach for washing, deburring, de-coring and/or stripping all types of contaminants from parts, assemblies, molds, fixtures, and carriers using pressurized fluids. This approach makes use of the robot’s ability to make sure that these pressurized fluids contact 100% of the surface to be cleaned. Because of the precision of the robot, cleaning can be done more efficiently and cost-effectively than with existing industrial parts washers that use high volumes of heated, soapy water or stripping and de-coring systems based on chemicals. We will help you determine the best system for your needs. Contact us. Robotic Cleaning makes use of the appropriate fluid pressure required to clean or strip the desired materials without damaging the part surface. Utilizing the flexibility of a 6-axis robot allows us to put the right amount of Energy exactly where it is needed to clean a part. The more complex the part, the bigger advantage it is to use our robotic cleaning solutions for your cleaning challenges! 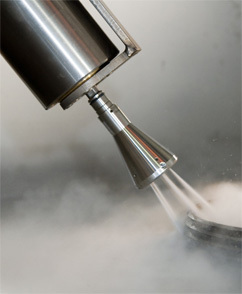 Contact TBD Enterprises to speak to us to determine if robotic waterjet cleaning is right for your application.